With the summer festival season now behind us, it's time to focus on some indoor, all-day electronic activity. BC's Contact Winter Music Festival has announced the details of its fifth annual event, which will feature performances from Australian producer Flume and a DJ set from UK brother duo Disclosure. 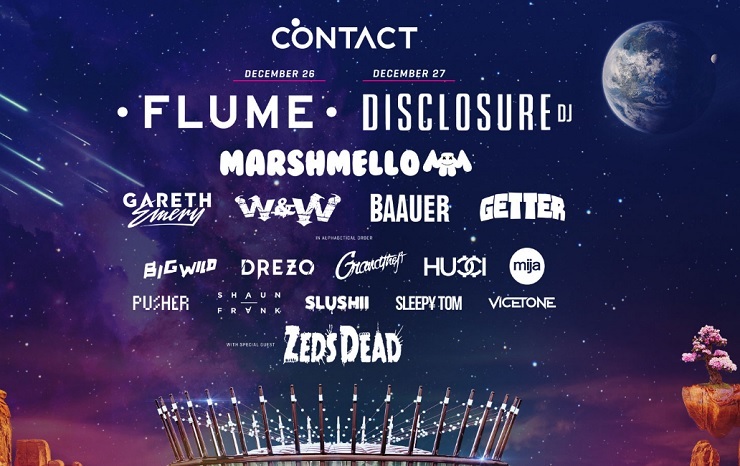 This year's Contact Winter Music Festival is being held at Vancouver's BC Place on December 26 and 27. The two-day affair also brings out Zeds Dead, Baauer, Marshmello, Gareth Emery, W&W, Hucci, Getter, Sleepy Tom, Slushii, and Big Wild. Even more artists are expected to be announced in the coming months. The annual all-ages event has been sold out over the last three years, with the upcoming two-day instalment, run by promoters Live Nation and Blueprint, expected to bring in over 36,000 dance music fans. "We can't believe it's been five years already," Blueprint founder Alvaro Prol said in a statement. "We feel like we're just getting started with Contact, and hope to have a long journey ahead of us with this festival. And BC Place is such an incredible stadium to work with, it helps make this one of our favourite events to produce each year." A two-day weekend pass will retail for $150, plus service charges, while single ticket and VIP package options will also be made available for this year's Contact Winter Music Festival. The general on-sale for tickets is this Thursday (September 29). You can find out more info over here.